Research [fundamentally] plays a pivotal role in its contribution to knowledge generation and hence the development of a knowledge- based society. In many developing and emerging economies, investments in research and innovation have resulted in new knowledge and ideas, discoveries and technologies with application in the industries, health, agriculture, fisheries and the energy sectors. Equally important, is the engagement in research methodology and investigation that contributes to a professionally qualified and trained manpower with skills in leadership, development of creative thinking and critical minds, skills in solving complex problems, dealing with difficult issues and exploring the unknown – THE FUTRE! The Outgoing Papua New Guinea Minister for the Department of Higher Education Mr. Francis Marus rightfully put it, during the Official Hand over, Take over ceremony, “Research, Science and Technology is a sleeping giant that has immense potential to grow our economy and thus the need for the Government to invest more into this sector”. 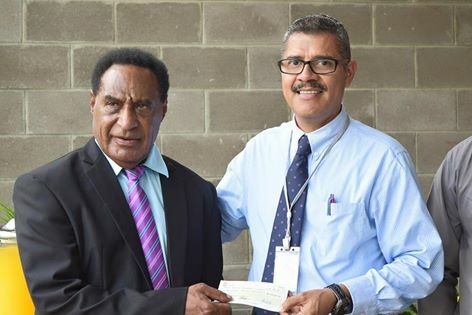 And to support the Government’s priority in that area, at Pacific Adventist University (PAU), the new Minister for Higher Education, Research, Science& Technology Mr. Pila Niningi was excited as well as very pleased when presenting a Cheque of K200, 000 for the Pilot Bio - Fuel Project to the Deputy Vice Chancellor for the Pacific Adventist University Professor Jeff Crocombe. He also acknowledged and thanked the Deputy Managing Director for PNG Science & Technology Secretariat, Dr. Kulala Mulung, Representative from the Department of Planning & Monitoring, Officers from the Ministry of Higher Education, Reseach, Science & Technology, Officers from the PNG Science & Technology Secretariat and the Academics & Staff of PAU, especially the School of Science & Technology for spear heading the Innovative Clean Energy Bio - Fuel Research Project.